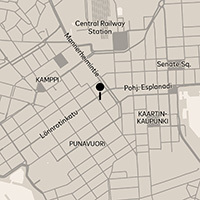 Experience the Helsinki city center and its surroundings in a unique way. Hotel St. George represents a new chapter in the story of luxury hotels. The hotel is located next to the Old Church park, only a few steps away from everything that Helsinki has to offer. Helsinki’s most stylish hotel has up to 148 guest rooms and 5 suites - offering unforgettable and relaxing experiences in Helsinki - just meters away from the vivid city centre. Whether it's a business trip, a long weekend with good friends, a romantic weekend for two or your wedding night, you will find the perfect room to fit your needs. Don't forget to pamper yourself with treatments and massages at St. George Care Spa. The Playground gym designed by Hintsa Performance is open 24/7. Wintergarden, restaurant and bar at the heart of the hotel, is a meeting place for everyone. Restaurant Andrea - where Nordic and Anatolian kitchens meet - was brought to Helsinki by world acclaimed Finnish-Turkish chef Mehmet Gürs. St. George Bakery is a bakery, a cozy café, and there you'll also the first ever Monocle Shop in the Nordic countries.